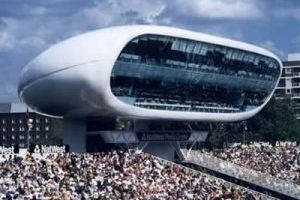 As it's the middle of Architecture Week and I've shown you the worst building in London, I thought it was time to show you one of London's more artistic buildings: the Natwest Media Centre at Lords Cricket Ground, designed by Future Systems. For some kiddie fun, including a building quiz, click the title link and say "Hello" to Archie. Not The Da Vinci Code!